There are just under 3 months to go until we line up at the start line. The sensation of nerves tingling with excitement and anticipation rushing through our bodies. And for some, perhaps a strange and quiet sense of calm. I don’t know about you, but I can’t wait. But here’s the thing, doing this crazy long-distance OCR stuff is a journey. I believe that embracing and enjoying the entire process leading up to these events is insanely important, not just the event itself. The countless hours of training that we are throwing down is all part of the reward! Before we even get to that start line we will have grown, challenged and argued with that little demon in our heads. We might have given up in some interval sessions, or we might have done them when we shouldn’t have. This is all part of the adventure and vital to keep in mind. 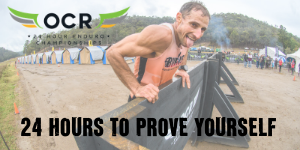 I want to impart that you have 3 months to go, which is a LOT of time to get things ready and prepared for one hell of a race (it’s also an amount of time that can pass VERY quickly if you let it). You are investing a lot of time, money and emotion, therefore, to do the race justice, you should also invest an appropriate amount of respect, work and planning to it. This is one of the first things you learn when you join the military - that you should have a well thought out plan. However, we are also told that as soon as you hit the beach your well thought out plan can also be completely useless. What I take away from this lesson is that planning, in and of itself, is what’s important. Thinking about what can and will most likely go wrong, and your contingencies to handle those situations (your back up plans), will hopefully help avoid these things occurring, or at least minimizing the impact if they do. Risk management and avoidance at their finest. There are some people that believe that I overthink/over-prep these things. That might be true (it totally is), however I haven’t been DQ’d for not having a spare headlamp, nor have I spent the night in a tent with hypothermia for not having extra layers of clothing available. I have seen people miss the opportunity to crush their goals on race day because they didn’t take the time to think a little bit ahead, and to set themselves up for success. Something as simple as thinking ahead to say, “if I fall off the monkey bars and into the water and my headlamp falls off, I may be DQ’d or at least have to slow down because I can’t see as well without it. How could I prevent that? I could tie a string to it, and I could have a spare”. Problem solved. Also, please don’t use your TV remote batteries as your spares. Don’t try save 5 dollars or buy rubbish gear when you are spending hundreds or even thousands on a race, travel, accom, etc. etc. It’s just not worth it. All these things can lead to reduced goal/performance expectation and outcomes. Now, I hear what you’re saying, “Alex, I’m not here to win this thing, so what if I don’t have a perfect race?” But if I am, you are, we are being truly honest with ourselves, we know how it feels going to bed with a head full of ‘what ifs’. What if I had a spare headlamp and didn’t need to spend the night in the pit, what if I had brought warmer clothes. I was so close to my mileage goal, if only I…!!!! We all want to do our best, so let’s not let lazy preparation be the reason we don’t get there. So team, please start looking at your gear and think about what gear you are going to use, and where things may have gone wrong last time. NOW IS THE TIME TO READ!!!! People have done this before, so learn from their victories and their mistakes. Read race reports, Tegan Angel and Lachie Dansie have some good tips, join the Facebook group “Going long 2019 – 24 Hour Enduro World Championships”. Hell, read about World’s Toughest Mudder and the Spartan 24hour Ultra. Plan what you want to do in the pits, including how long are you going to stop and what you want to wear when. Most importantly, talk to your pit crew and get them revved up. Outline your expectations and let them know your goals! YOU MUST BE ON THE SAME PAGE! Start taking care of your feet NOW. Start getting the grinder out, cut your nails, and make sure they are sitting nicely in your shoes. Do you need new shoes? What about socks? Will you need new shoes by the time you get to the event? What gear needs maintenance? Have you pulled out your wetsuit from last year and washed it??? (for your sake I hope so… that stuff stinks pretty bad even a few days after - I’ll be using the coin laundry on the way home through Windsor to sort mine out after the race). You get the picture. So, start being a Stoic: what can go wrong, why can it go wrong, what can you do about it - but don’t wait for it to happen to you. Things will happen that you don’t expect, and that will happen at some point no matter how prepared you are. It’s important to embrace that thought, as it’s all part of that journey we were talking about. Come up with a plan to address problems that might arise. How do you have a plan for what you don’t know? Simple. Basically: pause, breathe, don’t panic, figure out what’s going on, then act. It’s something I can always come back to to break a panic, calm myself down and start working to a solution. Action begets fear! Do you know your why? Why are you going to push your body through 24 hours of acute pain and then possible ongoing pain for the weeks following the race? You must know YOUR why! Not my why, not anyone else’s - yours. Know it and own it!! Let it drive you. I’m not writing this to scare you, I’m writing this to EXCITE you and hopefully light a fire in you (and under you) to do little bits of prep each day to make sure that you are ready to go on race day with the best chance for YOUR success for YOUR why. I cannot wait to fist-bump, hug and get fired up at that start line with you all.